One of the first steps people take when trying to rank in the search engines is doing keyword research. A lot of people aren’t doing keyword research any more because Google’s tools don’t reveal as much data as before. But keywords do still send traffic and ignoring keyword research is a big mistake. Keyword research may seem easy to do, but most people only look at keyword volumes. Using keyword research tools to determine search volumes is important, but there are a few other things you need to look at when deciding what keywords to use. Here are some common mistakes that people make when doing keyword research. A lot of SEOs try to rank web pages for high volume keywords. 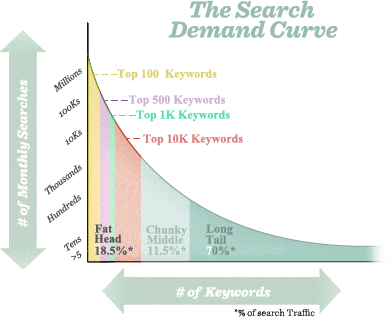 However, most search engine traffic comes from long tail keywords, i.e. you’ll get most of your traffic from a larger number of keywords with lower search volume. The blog promotion article is also twice as long as the keyword research article. Which article do you think gets more search engine traffic? The keyword research article sends more than twice as much traffic because it is ranking for more long tail keywords, even though it’s shorter and has less social shares. Evaluating one keyword phrase is not enough. You need to think about other long tail keywords that you could possibly rank for. Suggestion: Dig deeper and look for variations of keywords when doing keyword research. This will give you a better idea of how much traffic you can get from an article. Another important consideration before trying to rank an article for a keyword phrase is commercial intent. When people are searching for a phrase, are they looking for information or are they looking to buy something? Some keyword phrases are more obvious, like “wedding invitations”. Someone searching for “wedding invitations” is likely looking to shop for wedding invitations. However, a phrase like “baby shower games” is questionable. Is this person searching for ideas for baby shower games? Or are they looking to buy some baby shower games? Search engines will analyze user behavior to determine what type of content they are searching for. If no one clicks your listing or if people immediately click the “back” button after visiting your page, then search engines will notice this behavior. For example, let’s say you are selling a baby shower checklist and wanted to rank your e-commerce page for “baby shower checklist”. But most of the results currently displayed are informational articles rather than websites selling baby shower checklists. You might find that it is difficult to rank your page under these circumstances. Because most searchers are looking for free information in this case. Suggestion: Do a search for the keyword phrase you are trying to rank for to see what kind of results show up. If you are trying to rank an informational article and only commercial results show up or vice versa, you may want to reconsider. Asides from search volume, Adwords value also gives a good clue about how valuable and competitive a keyword phrase is. If advertisers are spending money on a keyword phrase, then it’s more likely that those prospects are converting into paying customers. And the more they are willing to pay, the more valuable it is. Note that Adwords value is more applicable to commercial keyword phrases than informational. Suggestion: Take a few minutes to research Adwords value before trying to rank your content for a keyword phrase. Is your content relevant to what you are trying to rank for? Another important consideration before targeting a keyword phrase is click-through rates. A lot of people blindly target the highest volume keyword. However, a lower volume keyword with a higher click-through rate can actually yield more visitors than a high volume keyword. For example, someone searching for “black raspberry fragrance oil” might be a better lead than someone searching just for “fragrance oil”. Such a prospect is looking for a specific item and is more likely to click through if you have exactly what they are looking for. They are also more likely to be ready to purchase. Don’t just ignore low volume keywords and automatically target high volume phrases. Sometimes a lower volume keyword can send more and better qualified traffic. Suggestion: Consider the click-through rate for keywords before investing heavily in SEO. Testing the click-through with a PPC ad may be worth considering. Finally, before trying to rank for a keyword phrase, evaluate the current search results. Check to see if the content you are trying to rank fits in with the content that is currently ranking in the search results. For example, let’s say I wrote a list post about SEO plugins for WordPress and I want to send search engine traffic to it. If I do a search for “SEO plugins”, individual SEO plugins will show up rather than list posts about SEO plugins. A backlink analysis will also reveal a lot of links that won’t be relevant to your blog post. It could still be possible to rank your web page for “SEO plugins”, but it may be too difficult and may not be worth your time. Suggestion: Take a moment to evaluate the current search results before trying to rank content for a keyword. Evaluate the current search results for competitiveness before attempting to rank a web page for a keyword phrase. To sum it up, keyword research is not hard but you will want to do more than just look at search volumes. New Features in AWR Cloud: GWT Stats and Algorithm Changes! Nice article, I enjoyed it!! Well I think people always make mistakes when choosing the right keywords. They just check keyword traffic volume and they don’t see how hard that keyword is for ranking, I always check Google trends it helps me find upcoming hot untapped keywords. keyword research is one of most important things to do as a marketer here is where most of us messed up for long time,i really had to read twice this post,it is a very informative post,thank you for sharing bro.